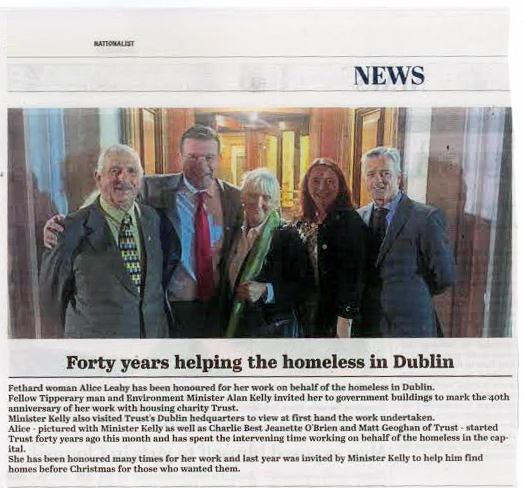 Fethard woman Alice Leahy has been honoured for her working helping the homeless in Dublin. Fethard woman and former Tipperary Person of the Year, Alice Leahy, has been honoured for her work with the homeless agency TRUST. Alice founded TRUST and has been its guiding light for many years. To mark International Women’s Day 2013 Rotary Ireland had a breakfast in the St. Stephen’s Green Hibernian Club in Dublin with a presentation on Women in Ireland : Past – Present – Future. 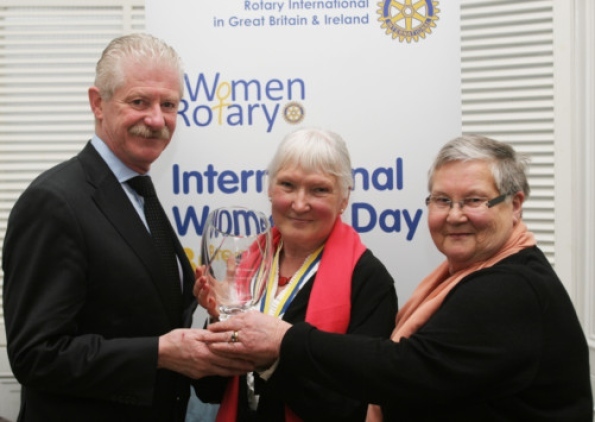 They presented Alice with an award for her work in TRUST and this was Rotary Ireland’s first presentation of its kind. A similar presentation took place in Belfast at the same time. It was with great sadness I read of the death of Fr. Donal O’Mahony, a member of the Capuchin Franciscan Order, affectionately known as Fr. Augustine by the many people who lived in extreme poverty, particularly in the Benburb Street area of Dublin City. We still meet people in TRUST who remember him. I first met him long before TRUST was established in 1975. I recall his long discussions and debates, often held in my tiny bedsit before he set-up Threshold. MY contact with him included attending family occasions for the people he knew; christenings, weddings, funerals, court appearances and time spent in cramped conditions having a mug of tea with elderly people living alone etc. I especially remember Harry, a homeless man from rural Ireland who was badly burned in a flat in Dublin. Long stays in hospital etc. had done little to clear his infections and heal his wounds. Fr. Donal and I brought him to Tipperary where he was cared for be devoted staff in St. Patricks Hospital, Cashel (then known as The County Home) for many months before returning to Dublin. In the excellent care of St. Patrick’s Hospital under the stewardship of Sr. Aquinas (she too now departed), Harry’s life blossomed, his wounds healed, his health improved but perhaps more importantly he was made to feel loved and wanted by the community in Cashel. Fr. Donal inspired and challenged all who crossed his path, never forgetting the philosophy of St. Francis. We would do well as a nation to follow his example, particularly where actions speak louder than words and where each human being is special. Hands off our hospital, 15000 in protest rally. Hands off our hospital services – that was the emphatic, defiant message that a huge crowd, estimated at 15,000, sent out to the HSE and the government on Saturday afternoon at the march and rally in Clonmel to protest against the threatened removal of acute services from South Tipperary General Hospital. The call to throng the streets was well heeded, as the event brought the town to a standstill. They came in their thousands from all over South Tipperary and beyond, men, women and children, many families marching together in what consultant surgeon Peter Murchan described as an unprecedented show of support. A broad spectrum of community and political organisations, sporting clubs, representatives of business, commerce and trade and many other groups, as well as people from all walks of life, were well represented in a massive display of people power that was expressed in a turnout that far exceeded expectations. The march gathered on Western Road, in the shadow of the hospital known to generations as St. Joseph’s and now known as the South Tipp General, before proceeding via Cantwell Street to Irishtown and into O’Connell Street. There the crowds heard impassioned speeches delivered from in front of the Main Guard by a variety of speakers that included sporting icons Aidan O’Brien and Eoin Kelly; Alice Leahy, founder of the homeless agency Trust; hospital consultants Dr. Paud O’Regan, Peter Murchan and Caitriona Crowe; and Barry O’Brien, chairman of the Tipperary County GAA Board. Bands from Carrick-on-Suir and Clonmel joined the parade and Banna Chluain Meala’s opening tune, “Beat It”, could have been a message from the march to the HSE. Banners were proudly displayed and hospital staff and volunteers went through the crowds collecting signatures for the petition supporting the retention of the acute hospital services. On Tuesday afternoon Cllr. Seamus Healy, chairman of the Save Our Hospital Action committee, reported that the petition now has more than 45,000 names. The fight to save the acute services was brought to Dublin yesterday afternoon, Wednesday, when a deputation of representatives from the area, led by South Tipperary County Council, met with Health Minister Mary Harney. In a statement issued on Saturday the HSE said that South Tipperary General Hospital (STGH) would continue to be the acute hospital for South Tipperary and its environs. “There will be no downgrading of services at the hospital.